Many American renters want to buy houses regardless of the cost of homeownership. For some, it’s a rite of passage and confers unquestionably grown-up status. For others, it’s the security of ownership: the home is theirs for as long as they want it. Of course, finances inevitably play a part. You’ll probably need to save a down payment and closing costs. You’ll also have to cover thmonthly cost of homeownership. Once you’ve moved in, you’ll need to be able to comfortably pay all those expenses that renters don’t have to worry about. In other words, the continuing cost of homeownership in all its forms. So what are those costs? How much, in hard dollars, might you be looking at? This article will help you answer those questions. Of course, there are periods when buying is obviously cheaper than renting. Those recently occurred when home prices and mortgage rates were both unusually low. The trouble is, those seem to happen mainly during recessions and depressions — when lenders are willing to offer mortgages only to those with stellar credit scores and huge down payments. So your chances of pulling off a classic buy-low-sell-high investment strategy or a fast flip are limited. It’s generally better to see homeownership as a long-term investment. Of course, market and economic conditions when you buy are considerations. However, years of owning one home or successive homes is likely to iron out all but the most severe of those. Historically, home prices nationwide follow a long-term, upward trajectory, and recover from falls within a few years. And remember: if you buy when mortgage rates happen to be high (which often causes prices to stall or drop), you can always apply to refinance your bargain home when they fall. For example, in October 1981, rates peaked at 18.45 percent for a 30-year, fixed-rate mortgage, according to Freddie Mac’s archives. It’s unlikely many owners were still paying that when rates dipped down into single figures less than four years later. 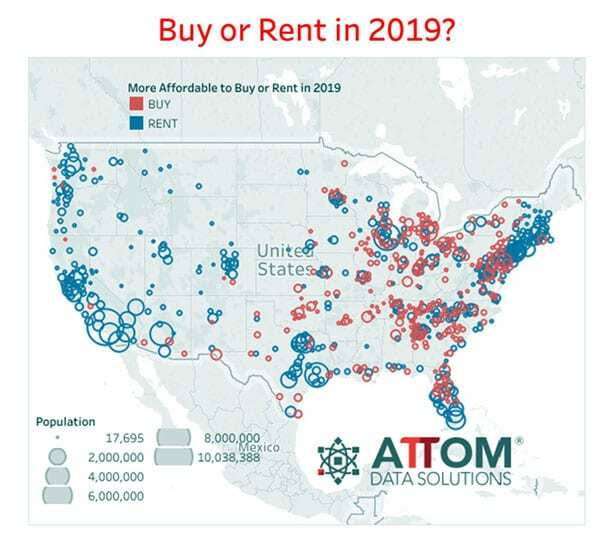 ATTOM Data Solutions, the self-described “curator of the nation’s premier property database,” suggests that 2019 began badly for aspiring homeowners. Only 41 percent of the counties surveyed were more affordable for homeowners than renters. So does that mean you should delay purchasing a home if you live in one of the 59 percent of counties in which renting is cheaper? Not necessarily. Of course, it does if your only interest is in your current monthly outgoings. But, if you have other motivations for owning your own home, such as fixing your monthly costs, or creating wealth, you may choose to prioritize those and leave it to time to iron out short-term wrinkles. Certainly, you may wonder whether home prices might increase sharply if and when the situation switches and the cost of homeownership becomes the more affordable where you live. Mess up your timing and you could end up paying more than you need for the property you eventually buy. Although you’re likely to think of them rarely or never, it’s the second type that often makes or breaks affordability. But let’s begin by exploring the ongoing costs, if only because they’re the ones that will be constantly on your mind. The “principal” is simply a fancy name for the sum you borrowed. And you won’t be surprised to learn that your mortgage lender would very much like it back. If you have a 30-year, fixed-rate mortgage (FRM), you’ll make the same payment every month. And while your taxes and insurance costs may rise, you’ll at least have nailed down the majority of your housing cost (unlike renters, who may be subject to increases any time landlords can justify it). The lower your principal balance (all other things being equal), the lower your housing costs. You can control this by purchasing a cheaper home, or by making a larger down payment. One big factor in what you pay for your home each month is your mortgage interest rate. Every month, you’ll pay mortgage interest for the previous month. Your lender calculates this amount based on the remaining loan principal balance and your interest rate. Once the interest is taken care of, the remaining amount of your payment goes toward reducing your balance. The lower your interest rate, the lower your payment. You can control the interest rate by shopping for the best deal — mortgage rates vary among lenders by .25 to .5 percent on any given day. You can choose to pay more fees upfront to purchase a lower interest rate. And you may decide to take a loan product with a lower rate — such as a 15-year mortgage, or a hybrid adjustable loan with a rate fixed for three, five, seven or 10 years. With a fixed-rate mortgage (FRM), your monthly payment won’t change. What will change is the amount of the payment allocated to interest and what’s allocated to reducing your principal. So if, for example, you owe $300,000 and pay 4 percent, your monthly payment is $1,432. Of that, $1,000 goes for interest, and the remaining $432 reduces your balance. So the next month, your balance is $299,568, your interest charge is $999, and your principal reduction is $433. After 10 years (120 payments), $788 goes toward interest, and $644 reduces your principal balance. It’s important to understand that during the first few years of homeownership, you won’t be paying down your balance much if you make the required payment. You can choose to accelerate your mortgage payoff by paying extra. if your down payment is less than 20 percent, most mortgage lenders require you to purchase mortgage insurance. This can add hundreds to your monthly payment. Your mortgage insurance costs depend on the type of policy, your credit rating, down payment and loan term. For example, insurance for a 15-year mortgage on a 90 percent loan for a borrower with a 700 credit score is .44 percent. For a borrower with a 30-year, 95 percent loan and a 640 FICO score, it’s 1.19 percent. Government-backed mortgages also have mortgage insurance costs. In some cases, the premiums are called “funding fees.” You can control this cost by improving your credit score, increasing your down payment, and comparing the cost among different mortgage programs (FHA versus conventional, for instance). If the home you buy is in a planned community or condominium complex, you’ll likely have homeowners association dues or fees. These can range from a handful of dollars a year to insure a private road to thousands a month for luxury amenities and items like expensive insurance for beach-frontage in hurricane or tsunami-prone locations. In 2013, CNBC reported on a Manhattan condo that was then on the market for $95 million and that had maintenance fees of $60,000. Per month. HOA and condo payments can have a big impact on the cost of homeownership. Mortgage lenders count them in your expenses, and you should, too. A good HOA is financially healthy. Mortgage lenders evaluate the HOA’s financial condition before approving a home loan, because poor management can lead to foreclosures on units. But not all HOAs and condos are well-run. And even with good HOAs, extraordinary costs like earthquake damage or a huge lawsuit loss can arise. And these costs may exceed existing reserves. If that happens, the HOA imposes an “assessment.” That’s an estimate of the total cost, which will be divided up among the home or condo owners in accordance with a formula contained in the by-laws and rules. So you’ll have to come up with a one-time payment. It may be hundreds or thousands of dollars, and that can hugely add to your cost of homeownership. That’s why it’s essential that you or a professional crawl all over the HOA or condo association’s books and by-laws and rules before you buy. You must be sure the organization has sufficient funds to cover all eventualities. If you apply for a mortgage, your lender will do a lot of the legwork in order to protect itself. And you must be equally certain that you’re comfortable abiding by its rules, aka the CC&Rs (Covenants, Conditions and Restrictions). You may be banned from displaying political lawn signs, erecting a shed or playhouse in your own yard or having certain kinds of pets. Failing to honor these could see you fined, sued and ultimately (and rarely) foreclosed on by your HOA. Related: Should I buy a condo or a house (video)? According to the non-profit Tax Foundation, the average American pays $1,518 in property taxes each year. But that per-head figure disguises some extreme variations. To start with, property taxes are typically assessed on the value of the home rather than the number of people living in it. And then there are the wildly varying assessment policies and charge rates between different parts of the country. Those don’t just change from state to state. They can vary from city to city and county to county. And even within cities and counties. When the Tax Foundation analyzed the amount raised from property taxes in each state per head of population, it found evidence of these fluctuations. It published an overview in 2018, but had to use 2015 data. The most expensive places then were the District of Columbia ($3,350), and New Jersey ($3,074). As a rule, these taxes are highest in the Northeast. And they’re at their lowest in the Southern states, where states prefer to impose higher sales taxes and lower property taxes. So Alabama collected only $540 per person, while Oklahoma took $678. Real estate listings generally tell you what the current owner is paying. And that should be fairly close to what you’ll pay. However, in some locations, property taxes alter when the home changes hands, and that change usually involves an increase. Mortgage lenders count property taxes in your debt-to-income ratios. They usually take the annual amount and divide by 12 to calculate a monthly cost. Your lender may not give you the option of paying your homeowners insurance and property taxes yourself. Instead, it may require you to establish an impound or escrow account (not to be confused with the escrow process of buying a home). Every month, an amount to cover your annual insurance and property taxes is added to your principal and interest payment. In that case, your total mortgage payment is often referred to as your PITI, for principal, interest, taxes and insurance. The PITI represents the total payment you’ll make to your lender. Establishing an impound account can add to your upfront buying / borrowing costs. You’ll usually have to pay several months of these costs at closing to ‘front load” the account, so the lender has a cushion when these payments come due. Do you have to have impounds? if you put less than 20 percent down, you almost always have to. Otherwise, you may be able to waive impounds. What you pay for maintenance and repairs will largely depend on the age and condition of the home you buy. So, if you’re the first owner of a newly-built residence, you may end up paying very little for the first few years. And with new construction, most systems will be covered by warranties. However, if you purchase a run-down place with underlying issues, you could acquire a money pit. There’s nothing wrong with that it you go in with your eyes open. But you could be opening yourself up to a world of pain if you buy an old place without having a home inspection first. When Forbes looked at home maintenance and repair costs in 2018, they suggested that you should set aside 1 percent of the home’s purchase price for each of the first five years after it’s built. If your home cost $200,000, plan on $167 a month to establish your fund. Even if you don’t spend it all each year, you’ll have money for necessary repairs in the years or decades ahead. Once your home’s five years old, begin to ramp up that amount. And, by the time your place is 25 years old, you should each year be setting aside 4 percent of the purchase price. So we’re looking here at a significant element in your overall cost of homeownership. Obviously, all these are just averages. If the home you buy was especially well-constructed, you could budget less. Similarly, if you’re able to do much of the repair and maintenance work yourself, you may not need such a large amount. But, if your home was shoddily built and you have to call in someone to change a light bulb, you maybe should up your budget. An alternative to setting aside quite so much can be a home warranty. Many sellers even include one for the first year in your purchase price. Home warranties cover system failures like heating and cooling as well as appliances. You pay a policy premium and a co-pay for repairs that come up. That can be a lifesaver if your $2,000 water heater fails. So far, we’ve only looked at the continuing expenses that make up the cost of homeownership. But, to make a side-by-side comparison between renting and buying, we need to add the one-time costs of buying and selling. Those costs don’t necessarily include the expenses involved in physically moving. Renters and homeowners alike face those. Well, maybe not completely alike. Anecdotally, you may think that homeowners typically acquire more stuff than renters. And that they therefore often face higher moving costs. But that may be more than offset by the greater frequency with which renters tend to move. Zillow’s Consumer Housing Trends Report 2017 found that 26 percent of renters had moved within the previous 12 months, compared to only 6 percent of homeowners. There’s little reason to suppose those figures have sharply changed since that study was published. When you purchase a home, you should expect to spend between 2 percent and 5 percent of the home’s purchase price on closing costs. Why the variation? Well, different states impose different laws over purchases and some involve your jumping through additional hoops. And different lenders may have varying requirements. However, you may be able to drive down your costs by shopping around for suppliers other than those proposed by the lender. In some parts of the country, it’s the tradition for sellers to pay some or all of the buyers’ closing costs. And buyers can try to negotiate for sellers to pay those costs everywhere. If you were lucky enough to buy in a place where sellers customarily pick up purchasers’ closing costs, then expect roosting chickens when it’s your turn to sell. That 2 percent to 5 percent of the home’s purchase price is likely to end up on your tab. But your biggest single cost is still likely to be your real estate agent’s fee. Because that typically comes in at 5 or 6 percent of your final sales price. Small wonder so many sellers are turning to discount agents, who charge much less but offer the lowest of low-frills services. Other sellers may try to sell their homes themselves. Expect other costs before you sell. For example, you’ll benefit by cleaning and decluttering your home. And you may make money by staging it. You can save a bundle by doing these things yourself. But budget for some expenses, no matter how much of your own labor you use. We’ve now been through the major expenses that make up the total cost of homeownership. Phew! Some of those were pretty scary. So it’s a relief to get onto the element that usually makes it all worthwhile. And that’s the money you make simply by owning your own home. This accumulates when home prices increase. Even after allowing for inflation, average home prices nationwide very nearly quadrupled over the 60 years between 1940 and 2000. Giving each dollar the same purchasing power it had in 2000, the average home price was $30,600 in 1940 (or $2,938 in 1940 dollars). In 2000, it was $119,600. Of course, we all know such long-term gains are not guaranteed at all, and certainly not over any shorter period. Indeed, home prices began to fall at the start of 2006 and continued to do so for the best part of six years. However, by the third quarter of 2018, only 4.1 percent of mortgaged American homes were still in “negative equity,” meaning the mortgage balance exceeded the property value. So how come those in that 4.1 percent are still suffering? That may be partly down to poor lending practices before the credit crunch. Previously, an applicant’s ability to mist a mirror was the go-to criterion for some lenders when it came to approving mortgages. But, for many, the local economy is a more important factor. That’s a particular danger for anyone who bought (or buys) in an area that’s unusually dependent on a single employer or industry. Such a local economy is vulnerable and could crumble. Historically, that might have occurred as a result of the Great Recession. But other reasons remain live threats: new technologies, perhaps, or overseas competition. In such environments, it’s easy to find yourself owning a home where few others wish to live because they can’t find work. So the supply of homes outstrips demand and that drives down prices. As a nationwide average, home prices are currently on an upward trajectory. And they have been for seven years or so. At one point (July 2012-July 2014), they increased at a rate of 10 percent a year. But, since then, annual growth has eased off. So, in the year between November 2017 and November 2018, CoreLogic reports growth in its home price index of 5.1 percent — well above both inflation and average wage increases. For the year from November 2018 to November 2019, the company is forecasting an only slightly more modest increase of 4.8 percent. That’s the figure we’ve used in calculations below. All those numbers we’ve explored so far are hard to keep track of. So let’s try to consolidate them into a table that shows a solid example. In fact, we’ve done three tables, one for the cost of homeownership, and two for the cost of renting. Of course, there are no guarantees things will work out — only projections based on past trends, and based on our best understanding at this time. And the table uses nationwide averages mostly, which might not apply where you buy. Still, you can use your common sense and local knowledge to construct your own models based on this template. Our model is based on your buying a $260,000 (the median price for existing homes in the third quarter of 2018, according to Fannie Mae) with a 30-year, fixed-rate mortgage. And we’ll assume you’ll make a down payment of $10,000 and pay a mortgage rate of 4.45 percent, which Freddie Mac says was the average for that sort of loan during the week ending January 10, 2019. Get quotes to find out the sorts of rates you might be offered. And then use our mortgage calculator to discover your monthly payments based on the size of your loan. You’ll find the figures on which we base our other numbers in the paragraphs above. Where possible and appropriate, we’ve chosen the mid-range of those. However, for repairs and maintenance, we’ve gone higher. That’s because we’re assuming you’re buying an existing home, so you won’t be getting the lower costs enjoyed by those with newly-built ones. For homeowners’ insurance, we’ve gone for the Insurance.com estimate of the national average premium of $1,737 for a $300,000 dwelling with $1,000 deductible and $300,000 liability coverage. We’ve assumed you’ll make a relatively small down payment of $10,000, which is just under 4 percent of the purchase price. As long as your credit score isn’t too bad and your other debts are limited, that should get you a mortgage with Fannie Mae, Freddie Mac or the Federal Housing Administration (FHA). However, if you do this, you’ll have to pay private mortgage insurance premiums. The period for which you’ll have to do this will depend on home price rises in your area and the type of mortgage you select. We’re assuming that you go for a Freddie Mac or Fannie Mae mortgage and will be free of PMI after 103 months. You can quickly see that homeownership becomes more attractive the longer you live in your home. After 30 years, you could have a home worth $1.06 million, if that 4.8 percent annual rise in home prices continues all that time at the same rate. And your biggest single expense, the principal and interest on your mortgage, would have cost you $453,000. So, even after all the other costs, you could be well ahead. But that simplistic calculation fails to take into account the fact you and your loved ones would have had to live somewhere during those three decades. Presumably, you’d have had to rent a home. So you have to deduct from your cost of homeownership the amount you’d otherwise have paid in rent. How much might that be? You’ll find out soon. To do a worthwhile side-by-side comparison between the costs of owning and renting a home, we should compare like with like. So let’s assume we’re looking at the same house for each: one worth $260,000. Landlords typically charge each month between 0.8 percent and 1.1 percent of a home’s value. So why not go for the midpoint of 0.95 percent? That would give us a monthly rental of $2,470, which is $29,640 annually. But, according to the US Census, the average gross rent in the US in 2017 was $1,082. It may not be for a comparable home that the average homebuyer purchases, however. Many renters tend to live in apartments that don’t offer the same features as a home. Because renters typically move home more often than homeowners, you might want to add some of the associated costs to your calculations. These might include application fees, security deposits, pet deposits/fees, move-in fees and brokers’ fees, as well as something for the more frequent removal expenses that come with renting. You may never have to pay these and the other nine listed. Or you may get demands regularly. That should largely depend on how “good” a tenant you are. We’ll assume you’re a perfect tenant. If you choose somewhere with optional amenities, you may face separate monthly charges for a parking space, yard maintenance, access to gym or pool and other services and facilities. But let’s assume you’re frugal and pay none of these. Your lease should specify whether or not some or all utility charges are included in your rental payment. But we didn’t include these in the homeownership calculations, so we won’t for the renting one. If your lease does mean you don’t pay for these, you should reduce your cost of renting calculation accordingly. However, bear in mind your next landlord may be less generous. Of course, renters’ insurance isn’t always mandatory, although landlords increasingly require it to cut their own risk. And how much you’ll pay if you want it will depend on many factors, including where you live and how valuable your possessions are. But Insurance.com reckons a policy in the price range $120 to $190 a year could buy you coverage of $25,000 for personal property with a $500 deductible. And that may also include $100,000 in liability protection. We’ll use the midpoint of $155 per year for our calculations. A homeowner who buys using a fixed-rate mortgage knows that her first payment will be exactly the same as her last — and that the same goes for all the ones between those two. The same does not apply to tenants, who can expect regular rent reviews. Of course, rents can go down as well as up. And in some markets, where supply outstrips demand, falls do happen. But the overall nationwide trend has been firmly upward for some years. You might expect, in theory, rents to closely shadow home price indexes. After all, if landlords are aiming to get 1 percent of the home’s value each month, then the rent they charge would have to move in line with home prices. However, no matter how sound the theory, the practice is different. Sometimes, home prices outstrip rents and sometimes it’s the other way around. But, overall, rental inflation is noticeably slower than that for home prices. So U.S. Census data shows that, after allowing for inflation, median home prices rose 290 percent between 1940 and 2000. Meanwhile, median rents went up only 112 percent over the same period. So, for our calculations below, we’re going to assume that rents rise in line with the general inflation figure for 2018, which was 1.9 percent. Some are forecasting the same rate for 2019. Of course, it will move at some point. But nobody knows when it will change, by how much or even the direction of its travel. There’s a much smaller table for renters. That’s because landlords carry many of the continuing expenses that homeowners face. Indeed, many tenants need find only the rent. But we’re including renters insurance because it’s a sensible expenditure and many tenants value the protections it brings. Remember, all the figures in the table provide for an annual inflation rate of 1.9 percent. Of course, you don’t have to rent such an expensive home. But the homebuyer doesn’t need to purchase such an expensive one, either. Whether you go up- or downmarket, the basic math is unlikely to get wildly different. Here is a table for renters who choose the average rental — most likely an apartment, with fewer amenities than the average home. After a year or two, and depending on your circumstances and location, renting is likely to be more expensive than owning — in spite of all those seemingly scary numbers in the homeownership table. Nothing better illustrates this than running the numbers based on 30 years. Over that period, buying will have cost you $1,161,502 (not allowing for equity gains), compared with renting a comparable house, which would cost you $1,189,976. That’s less than $30,000 in savings. And, over 30 years, such sums are neither here nor there. Except, after 30 years of buying, the homeowner has an asset worth over $1 million, while the renter has … nothing. And, of course, the renter has to keep paying after the 30 years are up, while the buyer has finished with her biggest cost of homeownership. Meanwhile, her property may continue to appreciate in value. Another factor in buying versus renting is that paying into a mortgage every year creates what researchers call “forced savings,” which is money invested that you’d otherwise probably have spent. Harvard University’s Joint Center for Housing Studies concluded that buyers create over 27 times as much wealth as renters, mostly because their mortgage payment forces them to save rather than spend. If you choose to rent rather than buy, you’ll need to be much more disciplined about saving unless you want to retire broke. Of course, relatively few homeowners remain in the same place for 30 years. And, every time you sell or refinance, you reset the clock on your mortgage. That’s likely to cost you in money and in the time it takes you to become mortgage free. But one way to moderate the impact of that is to borrow with shorter-term mortgages, once you can afford to do so. or do what many ultimately do: sell their house, take the tax-free (for those over 55) gain and use it to buy a less-expensive house for cash. God-bye, mortgage payment. Renting vs. buying is more than a matter of dollars and cents. There’s an additional element, which you might dub, Cents and Sensibility. Some have personality traits that might make them perfect renters. They revel in the feeling of not being tied down. They’re free to move home, city, state or country whenever the whim takes them. However, others dislike renting for various reasons. Those include the possibility of being forced from home next month or whenever the lease is up. Some dread the prospect of looming rent raises. Or hate the need to conform to the landlord’s restrictions on everything from decor to running a business from a spare room and owning a pet. Speaking of landlords, some renters resent making theirs rich. Finally, some also see renting as a sign of failure in the game of life. As childhood and college friends buy homes, they may feel left behind. Studies have shown that homeowners are more committed and more involved in their neighborhoods — a positive thing. And many homeowners see their ownership as a badge of success — a part of the American dream — and they’re living it. They may also see it as a rite of passage that proves their adulthood. Some also enjoy the security of tenure they have: their home is theirs. And they love not lining a landlord’s pockets every month. But there are darker moments. Some homeowners face real hardship. Their loans may be underwater. They may face impossible repair bills. What if they fall behind with the mortgage and have to endure foreclosure? Or they may worry about being forced to move for work or family reasons and being unable to sell. How do you cope with being an accidental landlord when you’re hundreds or thousands of miles away? Personal finance experts don’t always agree on the value of homeownership versus renting. But one thing they do agree on is that there is no one decision that’s right or wrong for everybody. It comes down to personality, finances, goals, age and family. Some of those points are great advice. Others are more debatable. Dave Ramsey confirms, “Renting as a way of life is not something we recommend.” But he advocates a similarly cautious approach to buying a first home as Orman. Indeed, if anything, he’s even more conservative, suggesting nobody buys until they’re entirely free of all debt. That’s a fine goal, but one that few first-time buyers achieve. Other than those, he advocates buying as soon as possible. He acknowledges that he’s been a homeowner for 20-odd years. But he suggests that there may be markets in which renting is smarter. To know if that applies in the place you want to live, he recommends finding your local price-to-rent ratio (or P/R ratio). You find two similar homes, one for sale and one to rent. Then divide the sale price by the annual rent. If the result in less than 12, buy. If it’s 12-15, weigh your options. When it’s over 15, rent, he says. Just don’t forget about Cents and Sensibility! That advice is a great note on which to end this guide.